The 314m-high MahaNakhon mixed-use tower is the tallest building in Bangkok. Image courtesy of Ole Scheeren © OMA. Designed by Ole Scheeren, the building is characterised by a pixelated carving spiralling along the length of its facade. Image courtesy of Ole Scheeren © OMA. The tower comprises luxury residences, a boutique hotel, a lifestyle retail space, a multi-level roof-top bar and an observation deck. Image courtesy of Ole Scheeren © OMA. Cantilevered skyboxes and outdoor terraces feature in the pixelated carvings. Image courtesy of Ole Scheeren © OMA. MahaNakhon is a new 77-storey mixed-use, high-rise complex located in Bangkok, Thailand. At a height of 314m, it is the tallest building in Bangkok. The project was developed by PACE Development and its joint-venture partner, Industrial Buildings Corporation (IBC). Construction of the complex began in June 2011 and was officially completed in 2015. The 150,000m² development comprises luxury residences, a boutique hotel, a lifestyle retail space, an outdoor plaza and a multi-level roof-top bar. It was developed with an investment of THB19bn ($586m). The pixelated, glass tower was designed by German architect Ole Scheeren in 2009 while he was a partner at OMA. The MahaNakhon tower is located on a 3.6-acre site in the middle of the commercial business districts of Silom and Sathorn. The innovative complex is divided into three components, comprising the main tower, the retail centre and the outdoor plaza. The main MahaNakhon Tower houses luxury apartments in The Ritz-Carlton Residences, and the Terrace Bar and restaurant in the upper portion. The three-floor restaurant comprises double-height spaces and an outdoor rooftop bar and observation deck which offers a 360° panoramic view of the city. "At a height of 314m, it is the tallest building in Bangkok." The signature boutique hotel, Bangkok Edition, is located below the apartments at the lower portion of the building. The base of the building also includes the MahaNakhon Terraces, a seven-storied retail centre with a series of cascading indoor-outdoor terraces resembling a mountain landscape. 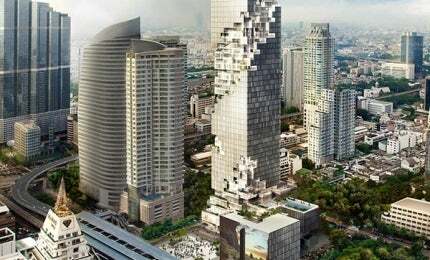 Located next to the main tower is the MahaNakhon Cube, a freestanding, seven-storey building. It features indoor and outdoor terraces corresponding to those of the MahaNakhon Terraces. A large outdoor public plaza named the MahaNakhon Square is located in front of the main tower. The landscaped area holds planned and spontaneous cultural events and connect the different competent of the MahaNakhon complex. Residents of the apartments are able to access their elevators via a private lobby while the retail spaces have separate entrances. The glass curtain-walled exterior of the MahaNakhon mixed-use tower features a three-dimensional pixelated spiral carving that coils up the along the entire length of the tower. The 5m-deep carving is made up of projecting glass skyboxes, combined indoor/outdoor spaces and oversized terraces. These elements appear as pixels from afar and provide the resident’s bird’s eye views of Bangkok and Chao Phraya River. The skyboxes feature three-sided floor-to-ceiling window walls and cantilevered living space extending out from the tower. The non-pixelated facade of the tower is made up of floor-to-ceiling window walls and operable full-height bi-fold balcony windows. The Ritz-Carlton Residences include 200 luxury apartments with simplex and duplex layouts, located over two zones. The two and three-bedroom Tower Residences extend from the 23rd floor to the 54th floor while the larger three, four and five-bedroom residences extend from the 57th floor to the 73rd floor. Wangjing SOHO is a mixed-use complex in north-east Beijing, China, which was developed by Chinese real estate company, SOHO China..
Due to the pixelation of the building exterior, some residences feature private skyboxes and large outdoor terraces with landscaping elements, and a sundeck for dining, leisure and entertainment. The Bangkok Edition offers 159 hotel rooms while the MahaNakhon Terraces comprise 10,000m² of retail stores, restaurants, cafes and a 24h marketplace. The MahaNakhon Cube includes international gourmet dining and lifestyle brands, as well as provides a direct above-ground pedestrian link to the BTS Skytrain and BRT stations at Chongnonsi. The construction of MahaNakhon was completed in two phases. The MahaNakhon Cube was completed and opened to public in early 2014. The construction of the main tower, the residential, hotel and remaining retail spaces were completed as part of the second phase in 2016. PACE Development is the executive architect and engineer while Bouygues Thai, part of the Bouygues Construction Group, is the construction contractor for the MahaNakhon project. Bangkok-based company PPS Group is responsible for the project management while Arup provided structural, mechanical and electrical engineering services during the design phase. Thai firm CPI Engineering Services is the seismic and wind engineering consultant while Front, a firm based in New York, is the facade consultant for the building. Isometrix is responsible for the lighting design and Husband Retail Consulting is the retail consultant for the project. David Collins Studio was engaged to design the interiors of The Ritz-Carlton Residences, which is managed by The Ritz-Carlton Hotel Company. The Bangkok Edition Hotel is managed by The Ritz-Carlton Hotel Company, in collaboration with Marriott International and hotelier Ian Schrager. Archetype Group was contracted to provide project management and construction management services for the MahaNakhon project.